What is the focus of your child's beautiful SMILE? Strong, healthy teeth! Baby teeth-also called primary teeth-are important in the growth and development of a child. Baby teeth can help your child chew foods and speak. They also hold space in the jaws for adult teeth that are growing under the gums. Babies are born without teeth. Usually baby teeth start to appear in the mouth when the child is 6 months old. By the third birthday, most children have a full set of 20 baby teeth including incisors, canines and molars. 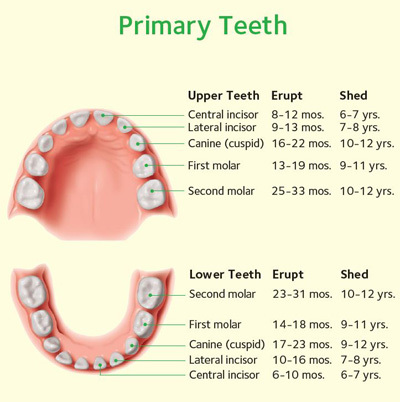 The chart below tells the names of baby teeth, when they come in (erupt) and when they fall out (are shed). Baby teeth be will replaced by permanent (adult) teeth. However, not all children get the same teeth at the same times. Your child's teeth may erupt earlier or later than the times shown here. Surprisingly, tooth decay can occur as soon as your child's first tooth comes in (erupts). So it is very important to start taking care of those "pearly whites" as soon as you see them peeking through the gums. If your child gets decay, your child can suffer pain and infection. Also, if a child is in pain, he may have trouble eating, sleeping and learning. The bacteria that cause decay are in everyone's mouths. Babies get these decay-causing bacteria from their caregivers, mom and dad, just as we all are exposed to germs in our families. These bacteria then stick onto the baby teeth. Brushing the teeth to clean off the bacteria is important to keep teeth healthy. Bacteria on the teeth use the sugar in foods and drinks and turn it into acid. Each time your child eats or drinks, this acid can attack the teeth for 20 minutes or longer after eating or drinking. Over time, enamel gets damaged, tooth decay develops and cavities appear. Children are more likely to get decay if their teeth are in contact with sugar often or for long periods of time. Babies should not be put to bed with a bottle. If your baby falls asleep with the bottle in his or her mouth, the liquid in the bottle pools around the teeth. Liquids such as fruit juice, soda and even milk contain sugar. Plain water in a bottle or sippy cup at the end of the day is a better choice. Protect your child's teeth by starting dental checkups early. The American Dental Association and the American Academy of Pediatric Dentistry recommend that the first dental visit should occur when the baby's first tooth appears, but no later than the child's first birthday. Why schedule a visit so early? A dentist can show you how to clean your child's teeth, talk about feeding, oral habits and recommend dental care products. He or she also can help you make sure your child is getting the right amount of fluoride (FLOOR-ide), a natural mineral that protects teeth. And your dentist can answer questions about your baby's teeth. Having a well-baby checkup at this age also connects your child to a dental home. This is a place where you can take your child from year to year. This helps the dentist get to know your child's and family's needs, so your child will have the best care. If your child is a toddler, the dentist will gently examine his or her teeth and gums, looking for decay and other problems. The dentist may also clean the child's teeth. Your toddler can also be checked for problems related to habits such as thumb or finger sucking. Fluoride treatments and dental sealants are two important ways your dentist can prevent cavities. Dental sealants are a coating that the dentist puts on the grooves of your child's back teeth to protect them. Your dentist will let you know if these treatments are right for your child. Preventive care from your dentist can save time, money and teeth. Your dentist will recommend a schedule for your child's dental visits. • Schedule your child's first dental visit before his or her first birthday. • If possible, schedule a morning appointment when children tend to be rested and cooperative. Don't schedule during nap time. • Stay positive. Don't show any anxiety that you might feel about dental visits. • Never bribe your child to go to the dentist or use the visit as a punishment or threat. • Make your child's dental visit an enjoyable outing. Teaching your child good oral hygiene habits early can lead to a lifetime of good dental health.